You have a choice of 2 SIZES! This Inklingo PDF includes the Sunflower shapes . . .
. . . and extra shapes for even more designs! 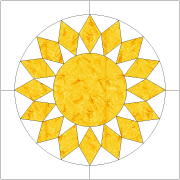 The Sunflower Quilt Design Book(108 pages) will help you sew a Sunflower quilt whether you follow a traditional pattern or create your own design. It will also help you decide which collection is best for you. 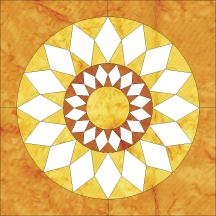 It includes worksheets and instructions for hand piecing, machine piecing, and hybrid piecing. It is free with this shape collection, so be sure to order it too. 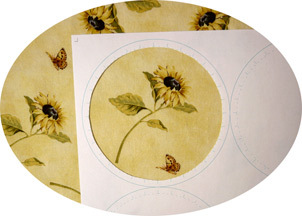 Sunflower is a spectacular design and with Inklingo, you don't have to be an expert quilter. Sunflower combines impressive small shapes with larger shapes which allow you to feature special fabrics, especially if you fussy cut.